Well nuts. The boys are at it again. Yep... my two favorite nut jobs. Duncan Donutz and Bingo Bob. It all started two weeks ago. After one of their famous arguments over politics, Bingo Bob decided to take action. I have to admit he was deviously subtle about it. When Duncan and his wife were gone on a short trip, ol’ Bob snuck onto Duncan’s property, molded two bags of potting soil into what suspiciously looked like a large, partially exposed set of buttocks, and then planted a bunch of pansies on the mounds. I actually thought it was kind of funny. Besides, those pansies kind of classed up Duncan’s yard. Duncan came home late on Saturday, but he didn’t notice the addition of the pansy derrierre to his flower garden until a couple of days later. I guess he was engrossed in watching March Madness or something. In any case, it took until Monday for him to see the bas relief in the middle of his Floribundas. You could hear his scream five blocks away. Almost immediately after, I swear I could hear Bob sniggering behind his privacy fence. I thought, ‘Uh-oh, here we go.’ I knew this was going to escalate. It always does. I just hoped it wasn’t going to get serious, but, deep down, I knew it never did. I, however, couldn’t wait to see the retaliatory strike. Sure enough, while Bob and his spouse were at their respective jobs, Duncan set to work. I saw him push his wheel barrow filled with sacks of soil, a shovel and one large, white lily over to Bobs. Now, you have to understand... Bob doesn’t have a flower garden. He did three hours later. Right smack dab in the center of his lawn. Duncan retreated to his garage with the sod he’d removed, the empty bags of soil, and his shovel. Being a cop, I could see he understood damning evidence and knew how to get rid of it. An hour later, his equipmment was clean as a whistle and the sod and bags disposed of in some distant garbage bin. I couldn’t really see his handiwork from my garage, so I got a nozzle pulled out my hose and sprayed a little water on my lawn. It was kind of obvious... after all, it had rained yesterday. It didn’t help... either the lawn or my vantage point. I rolled up the hose, put on my sneakers and went for my second walk of the day. I hoped nobody had seen me out walking at dawn. They might have found this a little suspicious. Oh, I didn’t make a bee-line for Bob’s. I was more subtle than that. I did a shortened version of my usual route, taking off in the opposite direction and circling back past Bob’s lawn. As I drew near, the lawn sculpture Duncan had made slowly became clear. Yep... there it was in all its glory. I wondered if Google Earth recorded it for posterity. I could almost envision zooming in on the image from space to see a perfectly formed limp phallus with a lily planted right in the middle. Apparently revenge is best served in a dirt nap. I shook my head and closed the garage door before Bob had a chance to see me. ‘Here we go,’ I thought. Sure enough, the next morning Duncan’s pickup had a Hillary Clinton bumper sticker on it. 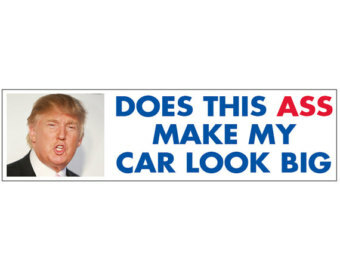 The day after, Bob’s pickup was plastered with Trump bumper stickers. 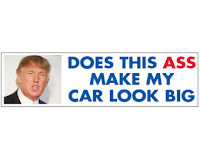 Two bottles of goo remover later, they were gone only to be replaced by an anti-Trump bumpersticker on Duncan’s truck and an anti-Hillary bumpersticker on Bob’s. That night the spouses put an end to it. They each stood over their respective husbands while they removed the latest bumper stickers and recontoured the gardens. I could tell, however, that this was far from over just by the exhanged looks on Bob’s and Duncan’s faces. Somehow I knew the respite would be short. There will be another chapter... I’m sure of it. A Tale of Two Bears... or Was It Two Bear Tales? The following is an excerpt from Fishing and Other Misadventures © S. Bradley Stoner 2013. WARNING: Graphic photo at end of story. Late in the morning of the late spring of 1981, I made a quick trip to my post office box in Victor, MT. The small lobby of the Post Office was abuzz. An animated man of about 50, a newcomer to the valley, approached me excitedly. “Did you hear what happened?” he asked, gesturing wildly. “Some guy got attacked by a bear last night! Bear came into his property and killed all his livestock... laid ‘em out one after the other. Then he tore up the bee hives he had... smashed ‘em all to smithereens. Well, when he heard the animals scream and the smashing of wood, he grabbed his gun and charged out in the dark. Ran smack dab into the bear about thirty feet from him, then the bear reared up an roared at him right before he charged. 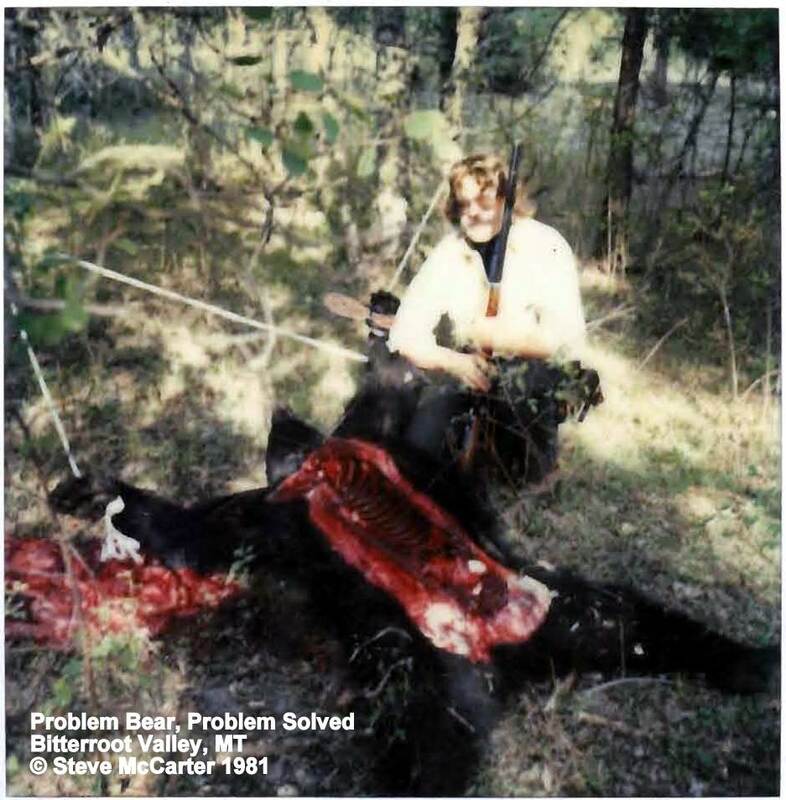 The guy unloaded on the bear, killing him. He skidded to a stop right in front of the guy! Boy I wish I coulda seen that. I heard that old bear had been tearin’ up the neighborhood for a week... almost killed a little kid up there... Would have if the kid’s mom hadn’t brought her in about a minute before the bear got there! Tore up some horses too... I heard they had to put down one of them, he was mangled so bad. Can you believe it... a vicious bear that close?” He paused to take a breath. Tale Two - What really happened. About five days before, I had gotten a call. A woman who lived about a quarter mile up the road in a newly built cabin called me in a state of panic in the late afternoon. Her little toy poodle had come up missing and she thought she had seen some big animal skulking about. Could I come up and take a look? No problem. I told her I’d scout on the way up to see what I could find. I figured it was probably a deer she had seen and the dog had taken out after it. It had happened before, but she was a young, new mother, originally from some city in the Midwest, and tended to panic at the slightest thing here in “the wilderness.” I don’t think she was entirely pleased that her husband had moved her here, although she did say she loved the mountains and the little home they had built in the pines. He was at work at the time, which explained why she had called me. Most folks in the neighborhood knew that I had finished my stint at the ranch and was working on machinery at my place, preparing for the haying season. At this time of day, I wasn’t worried about running into anything serious, so I headed up the road with nothing but the folding hunter in its belt sheath that I always had with me. I didn’t see anything on the way up until I turned into the timber just below her place. About ten yards in, a small tag of fluff fluttering from a small bush caught my attention. I wandered over to check it out, figuring it was probably nothing important. When I reached it, my senses went on alert. The scent of a boar bear still hung in the hot afternoon air and the soft ground litter held unrecognizable imprints of something large. The fluff turned out to be dog hair... poodle hair to be precise. I squatted and looked through the maze of tree trunks, scanning for any movement. A fly buzzed lazily, but nothing else moved. I proceeded to the woman’s home and noticed more tufts of poodle hair scattered about the porch. The bag of dog food had been spilled out of the garbage can that was meant to protect it and it was obvious something had eaten a substantial amount of it. The ground around it was scuffed up and nearby I found another tuft of poodle hair, this one was matted and wet. Things weren’t looking good for the poodle. She must have noticed me poking about because she opened the back door slightly and asked if it was okay to come out. I told her it was, nothing seemed to be about at the moment. “Did you find anything?” she asked tentatively. “It was in a garbage can,” she said defensively. “A big raccoon can tip that over,” I shrugged. “What do you think it was?” I probed. I figured that was the end of it. A opportunistic bear had taken advantage of a city slicker’s ignorance and had helped himself to a free meal. With new folks moving into the valley on almost a daily basis, I was sure he would continue to cash in on that ignorance. He’d probably continue to wander, but the fact that bears are creatures of habit raised concerns that he would be back through here. It was best not to take chances, so I let the neighbors know that there was a bear in the area. I figured he would lose interest if people were careful with their garbage, dog food, and other things that attract bears. I was wrong. The next day, before dawn, the bear struck again, severely injuring a horse a stone’s throw from my place. I went on alert. This behavior was highly unusual. He got around to my place on the next day. He laid out five head of sheep as they were coming in from the back pasture... it looked like he ran down the line swatting them. I found them almost immediately afterwards, alerted by the agitated barking of my dogs. The remaining sheep had run into the inner pasture in a panic and were milling about anxiously. The five the bear had killed were stretched out in an almost straight line, their spines snapped. Whether it was the dogs, or my presence, the bear had left, without touching them once they were dead. Killing one sheep, I could understand, but laying out five? This was very unusual behavior. The next night, the bear was back, this time going after the bee hives. He wrecked three of the nine I had in the pasture. We had a problem bear on our hands... what folks here called a rogue. The problem had to be handled. I called the local Warden and told him I intended to end the problem at the earliest possible moment. He asked if I had a bear license, and I assured him I did. I had picked one up the day the poodle came up missing... just in case. A couple of friends of mine had heard about the bear and asked if they could come up and have a go at getting him. I agreed. I wish I hadn’t. The bear was coming in at night. You need two things to get a bear at night. Decent light, and a good scope on your rifle. Patience doesn’t hurt either. That night, they took a position out in my pasture where I told them they could see the bear coming in. Sure enough, the bear came back. Unfortunately, my friends left their patience at home. About three in the morning, it sounded like World War III had broken out. I thought about going out into the pasture, and then rethought that. Adrenaline charged hunters with loaded guns... in the dark... not a good idea to take a nighttime stroll. I waited until dawn. They were pretty sure they had gotten him... they’d seen him run to the northwest after shooting. I walked out to that part of the property. I found the trail easily. The bear had left at a dead run, scattering pine needles and dirt. He’d made his jump a good four feet from the fence, and by the marks had cleared it and landed six feet on the other side. Impressive. But there wasn’t a speck of blood on that trail. I gave my friends the bad news. They had missed him clean. I wanted to be very alert that night, so I forced myself to nap during the day, but only after I had pounded some steel posts around the bee hives, attached insulators, and run wire around it, connecting it to a battery powered electric fencer. I switched it on to make sure it was working properly. The yellow indicator light blinked on and off, matching the satisfying buzz of electricity flowing through the wire. Even if the bear didn’t come in tonight, at least this would prevent him from bothering the hives again. I ran another electrified line around my inner livestock yard to protect the animals I had herded in. With the gate closed, they were reasonably safe as well. 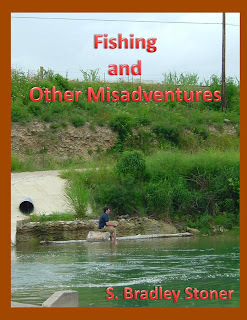 Around ten that evening I went out to where I parked my pickup in the pasture, put the rifle in the passenger seat, muzzle against the floorboard, and settled in to wait. A partial moon rose, bathing the pasture in a dim bluish light. It wasn’t like daylight, but I should be able to see the bear if it came in. You don’t stare when you are looking for something at night... you’ll miss it. You look in the distance, past your objective and let your peripheral vision work for you. The hours passed slowly. Bears are creatures of habit. If he ran true to form, as he had the last couple of nights, he would make his run around three in the morning, so around two, I eased out of the pickup, grabbed the rifle, and eased the door shut, making sure it closed all the way to douse the interior light. Then I took up a prone position to the right and slightly forward of the truck. The wind was with me, blowing out of the southwest, carrying my scent away from the bear’s usual path. The air was cool, not cold, so I settled in and waited. A half hour passed. Something started walking up my back leg. ‘Barn cat,’ I thought and ignored it. It continued up my back until it stopped just below my neck, stretching out to sniff my ear. Its nose was wet. Something was wrong with that. I didn’t move. The creature slowly came off my shoulder, made a little arc, and faced me. Uh oh. I was staring into the face of a striped skunk. It stretched forward to examine me closer. I wanted him to move away without making a move that would startle him. Out of the corner of my mouth, I blew a jet of air at him. Pfffft! He retreated an inch and blinked. Then he stretched forward again. I repeated the tactic. This time he looked startled and turned end for end faster than a frog dodging a heron. OH NOOO! There was little I could do, but squeeze my eyes and mouth shut and try to squeeze my nostrils as tight as I could. Still, this wasn’t going to be pleasant. I held my breath. I held if for what seemed to be a long time. Nothing. I didn’t dare move. Not yet. Finally, I carefully opened my left eye... just a slit, mind you. Fifteen feet away I spotted the waving tail of the skunk as he casually departed the scene. Disaster avoided. I resumed my wait. Time passes slowly sometimes. This was one of those times. Time just flat dragged. I was starting to get a cramp from holding my position so long, and was about to reach down and rub my thigh when I spotted the shadow slipping in from the tree line to my left. I froze, moving only to position the rifle, and then so slowly it would have taken an eagle eye to spot it. Bears are notoriously near sighted, but they make up for that with a keen sense of smell and intensely good hearing. My movements were silent. The bear stopped once and tested the air as he emerged fully into the open pasture, pointing his nose upward and slowly moving it in an arc. I could see that clearly in the pale light of the moon. I waited. The bear finally moved forward, rapidly covering the ground to the small stand of trees around a rock pile in the center of my pasture, not more than 60 yards in front of me. He moved silently, amazing for such a large animal, and then he just sat down in front of the trees to stare at the blinking light on the fencer. I slowly brought the rifle up to sight through the scope. The faint light faded as clouds covered the moon. Not good. All I could see was a darkness in the scope and a dark shape through my other eye. Ever so slowly, I eased the scope up until it was lighter above the hump of his shoulders. Then I brought it down just as slowly until darkness filled the scope. This was going to be chancy, but I couldn’t afford to lose any more livestock. It was a best guess. I sucked in my breath, let it out half way and squeezed the trigger. The explosion of the .300 magnum rocked the night and the bear tore away from where he sat, retracing his path noisily, crashing through the brush piles back to the edge of the timber. Then silence. I knew I’d hit him solidly, but I wasn’t about to go after him in the dark. I waited for awhile listening, then I stood, cradled the rifle, and walked back to my house to get a cup of coffee and wait for the dawn that was nearly two and a half hours away. At first light, I strapped on my recently acquired Ruger Blackhawk® .30 caliber pistol, took the rifle, and went out to search for the bear. I knew his path and followed it. A hundred yards from where the bullet had struck him, he had fallen. He was dead the instant the bullet penetrated, but still had enough oxygen in his system to run that far. He lay still just inside the edge of the timber. It was a large bear, weighing around 400 pounds and measuring over six feet from tip of nose to base of tail. He had a broad head, much broader than the local bears, one more typical of Canadian varieties. This was a transplant... a relocated problem bear, I guessed. That was later confirmed. The bear had been relocated to the edge of the Selway from Glacier Park. Their problem had become my problem and that night, the problem was solved. No attack, no big battle, just an anticlimactic end predetermined by patience and the animal’s own habits. Not quite as exciting as the tale at the Post Office. Funny how stories get warped as they’re told and retold. Even funnier how rapidly that happens. So I got up this morning and went out to test the morning air. Yep... it was still breathable. That’s a good thing. The sun wasn’t yet up, but my motion sensor light came on when I moved just a little toward it. Artificial sunrise. Not great, but better than nothing. I could see a little better. 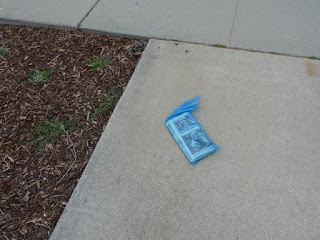 I wish I hadn’t, because there, laying on my driveway, was a little green plastic bag. I knew what was in it. They’ve been throwing one in my driveway for a week now. Let me explain. I used to take the newspaper. Yeah, the news was stale, but I liked the crossword puzzle and the funny papers. It was great for a number of years, but then they went and jacked the price... twice. Now, I understand profit and loss, but really folks, why would you want to pay nearly double for stale news a crossword puzzle and the funny papers? I cancelled my subscription. They’ve been trying to get me back ever since. Desperate times call for desperate measures, I guess. They’ve spent nearly a year’s subscription price on mailings telling me how much they miss me... offering me special prices (with the caveat that the price will revert to the regular price in six months with my annual subscription of course). They paid some call center employee countless dollars to call me with similar offers until I told them to take me off their list and quit calling before I reported them as a nuisance. I can’t be sure, but I think they sold my name and number to every call center out there soon afterwards. Now this. What is this? It’s the News Light. No, it isn’t some illuminating new take on daily happenings. It’s like light beer. Fewer calories, but no substance and no taste. In other words, no hard news... just fluff, and frankly I don’t give a rat’s behind about Flora Delarosa’s new flower shop where you can buy a bouquet and she’ll donate a dollar to some worthy cause. To be honest, I’m pretty sure Flora jacked the price of the bouquet to cover that donation, so, in reality, you are paying for the donation and she gets to take it off on her taxes. Talk about getting your cake and eating it too. Speaking of taxes... oh never mind. I don’t want to get started on that. I just finished my tax returns and I might get a little caustic in my remarks. 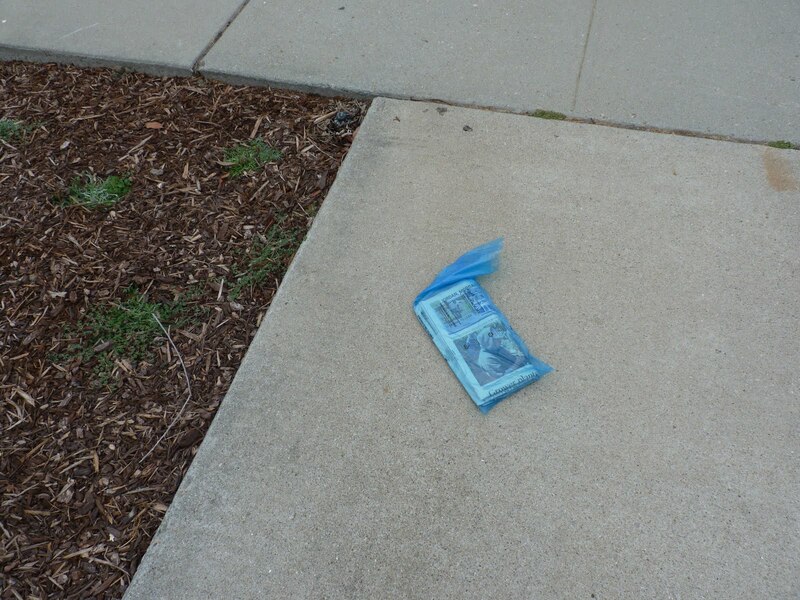 So, once again, I trudge down my driveway to retrieve the paper so it doesn’t wind up blowing all over the neighborhood with all the other former subscribers’ papers, and do what everybody else does... toss the thin plastic cover and shove the paper into the recycle bin. Boy, that’s what I call eco-friendly. I’d use it to start a fire in my fireplace except that you can’t do that very often down here because of air quality alerts. Well, I guess you could, but it wouldn’t be very neighborly. On the other hand, it’s been a little chilly in the mornings and a cheery fire might improve my mood after having to retrieve and dispose of yet another piece of advertising junk. I could subscribe on-line, but why would I? I mean Yahoo, Google, Twitter, and all the others are chock full of news. They have whole pages devoted to it. Most of it isn’t worth reading, so you have to sort through the crap to find the nuggets, but still... it’s free. And if you happen to linger too long over one of the many links in the news item, voila! You get a pop-up ad and the website gets a little revenue. Or course, one really doesn’t read the ad... one simply waits until that little X at the top right of the ad shows up and then clicks on it to make it disappear. Speaking of that, I have things to do, so I’m hitting my own little X and disappearing. Y’all have a wonderful day! Yesterday was a pain. We switched from analog cable to digital service for our phones, Internet, and TV. It wasn’t that it was difficult... it was time-consuming, but now my Internet is faster, our cost is down, and we have a cute little satellite dish mounted on the rear corner of our house. Ordinarily, I don’t mind the time thing. Like I’ve said, I’m retired. The point is, I had better things to do than wait for the two young techs to do the install. I’m not complaining about the techs, they were polite and reasonably efficient. This stuff just takes time away from what I’d rather be doing... you know, like fishing, writing, working on the landscape or building something. Oh well, water under the bridge as they say. Now, the day before yesterday was a mini-adventure. Yep... I went to my second favorite place... the Home Depot. I had a couple of things to pick up to make my lawn beautiful... well, keep it beautiful. I could have spent all day there, of course, but this was a quick in-and-out. I had stuff to do. So, I grabbed what I needed, threw it in a cart, hustled to the checkout, paid the clerk, zoomed outside to my car... and was stopped dead in my tracks. I wasn’t going anywhere for a while. Now before anybody gets their knickers in a twist, my beloved Explorer hadn’t become the victim of a careless driver or felonious Freddy. Nope, it was right in the parking spot where I left it, unsullied and serene. The spot next to me, however, had been filled with a new minivan. I didn’t pay attention to the make. They pretty much all look alike, despite what all the ads say. It wasn’t sleeker, more exciting, or more luxurious than all the others... it was a minivan. Useful for some things. Others, not so much. I digress. Oh, and the minivan itself wasn’t the problem... well, ultimately it was, but not for the reasons you might be thinking right now. No, the problem was the two toddler shopping cart, the four child car seats, the collapsed four passenger stroller, and a pile of stuff I had no desire to inventory that was blocking me. The back hatch was open and the couple stood back by the oversize cart bearing two by fours and a four by eight-foot sheet of three-quarter inch plywood, mentally measuring the cargo space in their minivan. Yep... I was going to be a while. A quick visual assessment told me that there was no way they were going to fit that plywood sheet into the van. The husband, however, was determined to cram it in there. He muscled it up to the edge of the bed, tilted it on about a forty-five-degree angle and commenced to pushing it. It made it about six inches before the top edge ran smack dab into the top edge of the hatch opening. “I don’t think that’s going to fit,” I offered. Determined to get the thing in the back of the van, the man issued an order to his wife to remove a couple of the seats and fully fold the others. She, of course, had the audacity to mention that if all the seats were removed or folded, they wouldn’t be able to put the child car seats in their proper restraints. That produced a look of consternation on the husbands face. I casually mentioned that when I was a kid, we simply rode on top of whatever lumber or other stuff we needed to load... no child restraints needed. She gave me a horrified look. I told her I understood how things had changed... that we had two boys, grown now, who had to be secured in their car seats when we had a minivan. She gave me a slightly drowsy look and explained that, in addition to the two toddlers that were now squirming in the shopping cart, they had three at home... all but one were required to be child restraint systems. Well, that would explain the four seats neatly arrayed beside my Explorer. I helped him boost the plywood onto the rack on the roof and while he secured it with what he called a rope... it was about a one-eighth inch cord... 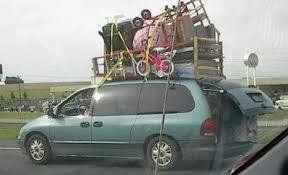 I helped his wife load the two by fours and repack all the other stuff in the van. Satisfied after she crammed the collapsed oversize stroller in the back, she stepped back and slammed the hatch before it had a chance to fall out. “No problem. Y’all drive safe.” Finally, I could get in my car and leave the parking lot. My fifteen-minute trip had turned into an hour and a quarter, but I got to meet some nice folks and give a helping hand. It’s what I like about Texas. Nobody’s in a hurry... even when they’re in a hurry. And me? Like I said, I’m retired. I’ve got the time. The Square Peg - Has Everybody Gone Mad? ?